Stunning Villa with lakeside and fountain view. This luxurious four bedroom villa is tranquilly situated beside a sparkling lake which is accentuated by eye-catching fountains. Cumbrian Lakes is an elite gated resort, accessed by a digital code so you can have complete peace of mind at all times. Paved walkways around the lakes give you an excellent opportunity to view Florida's natural beauty. With only 12 minutes travelling distance from the villa to the Disney theme parks you will see that Cumbrian Lakes is the ideal location for your vacation in the Sunshine State. Our immaculate villa has four bedrooms, three bathrooms, lounge with dining area, kitchen with breakfast nook, utility closet, pool and jacuzzi, lanai, extended deck area and double garage. The villa is fully air conditioned to ensure your comfort at all times. There are also ceiling fans in the lounge, master suite and lanai. - Comfortable lounge with 27" cable TV and combined DVD/VCR with a selection of films,games and books for your enjoyment. - Dining area with extending dining table and six chairs. - Fully equipped kitchen including large fridge/freezer, dishwasher, electric cooker, microwave, coffee-maker etc. Breakfast nook with table and four chairs. - Master suite with superb King-size bed and 25" cable TV. Two walk in closets,one with safe. Hair dryer provided in each bathroom. En-suite comprising large shower, corner bath and two vanity counters with wash basins. Separate WC. - 2nd master with Queen-size bed and adjoining bathroom. 20" TV. Walk in closet. 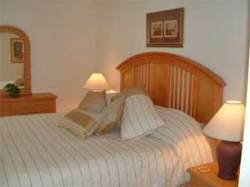 - Two twin bedrooms, each with ample closets and TV/DVD. Playstation 2 with a selection of games in one twin bedroom. Jack-and-Jill bathroom between the twin rooms. - Linen and bathroom towels provided. - Pool area accessible from both lounge and master suite. Covered lanai with table, chairs, and sun-loungers. - Extended deck area with swimming pool (30ftx12ft) and spa. Pool/spa heating available if required. 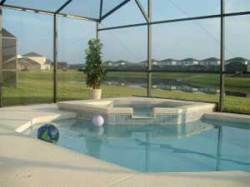 - Pool area fully screened. Relaxing views of lake & fountains. - Telephone with local free calls.